Our dear Ashleigh has begun her journey North of the Rainbow Bridge. In the past few days, she had become very weak and could not get up on her own. We tried everything to help keep her comfortable. When Ashleigh began to cry because she couldn’t get up and scream when we would try to help her up, we knew she was ready. She was surrounded by love and passed peacefully. Ashleigh is a sweet old gal who was found wandering the streets of Philadelphia exhausted and looking for food to fill her empty tummy and someplace where she could rest and be safe. At first it was thought she was totally blind, however, our vets tell us she can see some shadows and brightness. Ashleigh is a trooper! She has adapted to her handicap wonderfully and uses her hearing to compensate for her lack of sight. 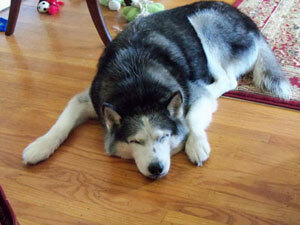 Ashleigh is happy and comfortable in her foster home and has a routine that is comforting to her. She requires two different eye drops three times a day. Ashleigh is happy and settled and will remain a MaPaw resident where we can love her and provide the medical attention she requires. Ashleigh is currently on eye medication that runs $60.00 every 2 – 3 weeks. A high price to pay, but certainly worth it for this loving special one.